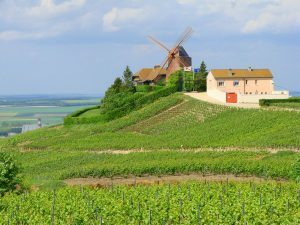 Wines have been produced from the soils surrounding Champagne Drappier for generations, but the story really begins in 1152, when an abbot known as Saint Bernard founded Clairvaux Abbey just a few kilometers north of Burgundy. With him, he not only brought his fellow Cistercian monks, but also a red grape known then as Morillon to make wine with. Morillon is an ancestor to Pinot Noir, which now dominates the vineyard area in the region. It was during this time that Saint Bernard had an annex built to Clairvaux Abbey, in Urville, and in it, built cellars that still remain to this day. Even though the abbey fell into poverty and was completely dissolved during the French Revolution in 1792, the largest wine cellar stayed intact in the church. 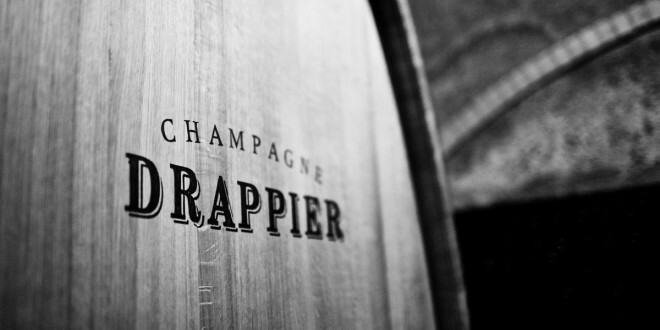 The story becomes the Drappier’s when in 1803, Francois Drappier, descendant of a Reims family of cloth merchants and lawyers, settled in Urville next to an annex to the abbey of Clairvaux, and began working a vineyard in the area which today extends over 55 hectares. 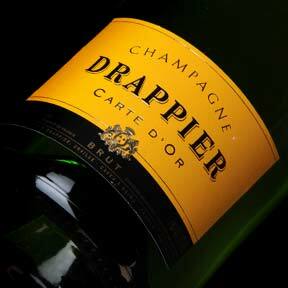 The Drappier family sold the grapes to the great champagne houses of Reims and Epernay for more than a century. After the phylloxera crisis it was apparent that something needed to be done. In 1930, Georges Collot, the maternal grandfather of Michel, the current owner, decided to pull up the traditional Aube Gamay, and replant the vineyards with the prestigious Pinot Noir, focusing on quality instead of quantity. Known has “Father Pinot”, Collot was essentially the driving force behind Drappier’s Pinot Noir heavy style. After the Second World War, the Drappiers started to expand the business and had the opportunity to acquire the cellars that were located in the annex to the abbey of Clairvaux that remained intact through the years. 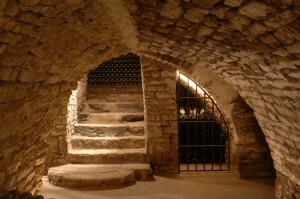 The former abbey’s cellar was far enough from the front lines to go through both world wars unscathed, preserving the history of winemaking on the distinct limestone soils of the Aube. 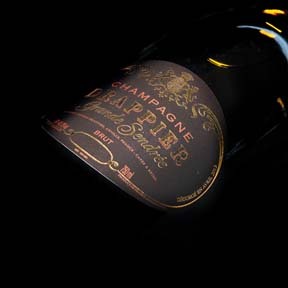 In 1952, Andre and Micheline Drappier, Michel’s parents, launch the Carte d’Or cuvee, with its distinctive yellow label. The Drappier house is now run by seventh generation Michel Drappier, and consists of 55 of their own hectares, 50 rented hectares, and 30% grapes bought in. The vineyard holdings are dominant in Pinot Noir. A two hour drive south from Champagne’s center in Reims and Epernay, you will find the Aube (or Cotes des Bar), an eclectic region in Champagne, home to big cooperatives, a hand full of superb grower domains, some conventional domains who often sell most of their crop to houses and co-ops, and many growers who sell all their grapes. There are some sizable vineyard holdings of important, well known houses, and Drappier, the largest and best known producer in the Aube, makes a home there, expressing the sub-region’s distinct terroir, within a region that is known more for blending, dosage and larger house styles. Closer to Burgundy than Reims, the Aube produces intensely flavored Pinot Noirs, which provide a different flavor profile to that of its northern cousins. Though most of Champagne is known for its chalk, in the Aube to the south, clay is the dominant soil type. The soils of the Aube are based on the Jurassic ‘Kimmeridgian’ soil typically found in Chablis and Sancerre. Kimmeridgian soil’s clay-limestone base, called ‘marl’ has presence in the Aube, and encouraged the production of wines with more weight and amplitude than the Marne, with a distinct racy elegance. There is an unmistakable signature of place expressed in the Champagnes produced here; a weightlessness reflective of the limestone. There is history in the Aube, as it was the wealthiest of the Champagne regions in the Middle Ages. Before phylloxera, there were many more vineyards in the Aube than in the Marne. For a while though, the Aube, with its distinctly warmer climate, had lost its reputation to the big houses of the north, becoming a mere place to purchase Pinot Noir fruit. Yet, the demand for grapes soared in the last 15 years, and with that, the importance of the Aube did too. Michel Drappier has been here to witness and play into the Aube’s rise in prominence and reputation as a distinct growing region of Champagne, which he attributes to the new prosperity the entire region of Champagne has seen as a whole. A rise in small growers making their own wine and an opportunity and emphasis on education, has brought more dynamic young winemakers to the region, developing the concept that Champagne can, in fact, have a sense of terroir. An area where Pinot Noir thrives, Drappier’s vineyards are planted in the village of Urville, set in the northeastern portion of the Aube called Bar-sur-Aubois. There is rich history there, as the vineyards were planted 2000 years ago by the Gallo-Romans, stretching down the surrounding slopes under the kindly eye of Saint Bernard, the founder of Clairvaux Abbey. Seven centuries later, in 1808, the Drappier family domaine was created, and has been passed down seven generations ever since. Drappier owns a total of 55 hectares in Aube, rents 50 hectares more and buys in some 30% of the fruit it uses in their cuvees. Overall, the proportions of vineyards planted are dominant with Pinot Noir, which holds 80%, with 12% Chardonnay, a small 7% Pinot Meunier, and an even smaller 1% of ancient varieties such as Pinot Blanc, Petit Meslier and Arbanne. Currently, 15 hectares are accredited organic since the harvest of 2014. Michel Drappier and his team have been cultivating the estate sustainably for years, and worked on the accreditation for 7 years. It’s one of the largest accredited organic estates in Champagne. The rest of the Drappier’s estate, composed of 42 hectares, is cultivated with sustainable methods: no preventive treatments, soil management (grass, compost), use of horses for plowing. In a time where it is global warming and climate change are growing concerns, Michel Drappier is even more committed to reducing their carbon footprint and creating a system of sustainability not only in the vineyards but in the cellar. For the last ten years, Drappier has been committed to sourcing sustainable energies. 45% of the electricity used by the House is produced by solar panels, and by next year, that number will increase to 75%. Plans to reduce fuel consumption to a minimum over the next 5 years have begun. Cellars avoid air conditioning by utilizing a free cooling system, while isolated air conditioning is strategically used throughout the property. 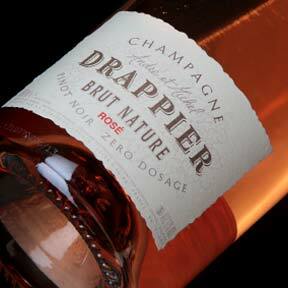 As of January 2016, Champagne Drappier is the first Champagne House in the world to have reduced their carbon emissions to a net zero carbon footprint, affirming their commitment to embrace environmentally friendly practices. In winemaking, Drappier’s philosophy has the tone of a non-interventionalist. Low temperature fermentation in stainless steel, indigenous yeasts, low sulfur treatments are employed to preserve the purity of their wines and to truly express the marked minerality given by the Pinot Noir they grow on limestone soils. And it is this expression that is important to Michel Drappier, as 2/3 of the grape supply comes from his own properties, and 2/3 of the remaining fruit from external providers comes from the Cote des Bar; a wine of true Aube terroir. The terroir particularly shines in their champagnes produced from fruit exclusively of Drappier’s own vineyard holdings like the Grande Sendree, the Brut Nature, which are both 100% Pinot Noir, and the cuvee Quattour, a special wine made of the ancient grapes Arbanne, Petit Meslier, Blanc Vrai (Pinot Blanc) and Chardonnay. It is not only this connection to Pinot Noir and terrior that define Drappier’s style, but their commitment to using low sulfites in their wines. Sulphites have been used in wine to protect against oxidation, but the Drappiers believe that excessive sulphites cause headaches and numb the palate to the perception of fine flavors. Their approach to limit sulphites starts in the vineyard, as they are cultivating wines using biodynamic methods: 1/3 of their vineyards have been converted and the other 2/3s are on their way. In the cellar, wines are unfiltered, with little sulphites added, they even produce a champagne absolutely sulphite free, which is a prototype in Champagne! 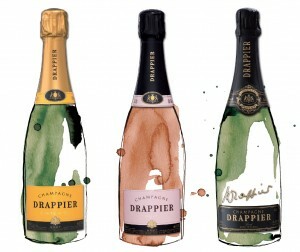 The Drappiers are passionate winemakers, and some of the most forward-thinking in France, that are devoted to expressing the terrior in Champagne production and their wines reflect the rich history, culture and commitment that have been transmitted through each generation and the wines reflect just that: purity of fruit, balance and expression. Vermilion gold in color. Nose of freshly pressed black grapes, of red, white and citrus fruits. Ample palate with flesh of vineyard peach and bouquet of aromatic herbs. Small spicy notes in the finish. 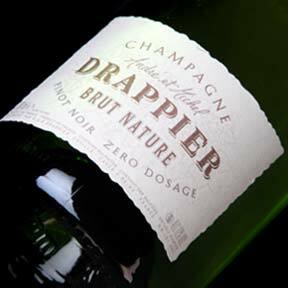 A fine, tightly knit Champagne of great purity. Golden in colour with amber nuances. The Grande Sendrée reveals subtle aromas of dried fruits, some touches of toast and wax, the whole unfolding into fruity notes of citrus fruits, fruits with white flesh, stoned fruits… The palate accentuates the vinosity, the depth and the structure.